This week is going to be as awesome as Oreos cookies. Why? Because, this week on my blog, it`s Cookies and Cream Week!! Yep, WEEK. 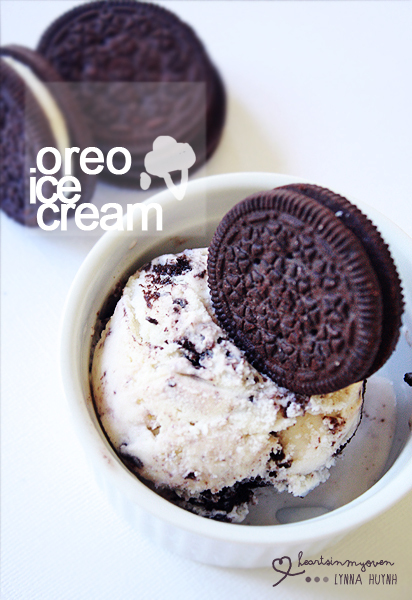 Since, I`m addicted to ice cream, cookies and cream ice cream is a DEFINITE MUST! I found this recipe on baked Bree and it`s a FANTASTIC recipe to kick start this week! When my boyfriend and friends tried it they said this: "Lynna, this is the best thing you`ve ever made!" The best thing. I`ve EVER made? I don`t know if this is a good or bad thing for me. I`ve made plenty of desserts before and I liked most of them...a LOT. Forget what you need make, make this now. I PROMISE you, this recipe will make you glad you did. 1. If your ice cream machine needs to be frozen ahead of time, do so ahead of time, preferably for 24 hours. 2. In the large bowl of your stand mixer, beat together the sugar and milk until the sugar dissolves. 3. Add the heavy cream and vanilla. 4. Follow your ice cream manufacturer's instructions to churn ice cream. 5. When your ice cream is ready, scoop some ice cream into your container, add a handful of crushed Oreos. Repeat layering the ice cream and crushed Oreos, ending with the ice cream. 6. Freeze the container for at least 4 hours, or until it reaches your desired consistency. Awesome! I am all for cookies and cream week! i NEED AN ICE CREAM MAKER! Ahah, I`m always like: ARE YOU SURE?! Hehe, I`m sure you won`t be disappointed! Ahah, then you must try this recipe!